SAN JOSE, Costa Rica – Why did the sloths cross the road? “It’s not that they have to cross, it’s where they were already living,” is the answer Esmeralda Arevalo-Huezo gives. A biologist and member of the Comité Científico de Vías y Vida Silvestre, she is among a core group of people spearheading an effort to combat roadkill in Costa Rica. Arevalo-Huezo was drawn to this issue when she realized that more animals were being killed by cars than by hunters. 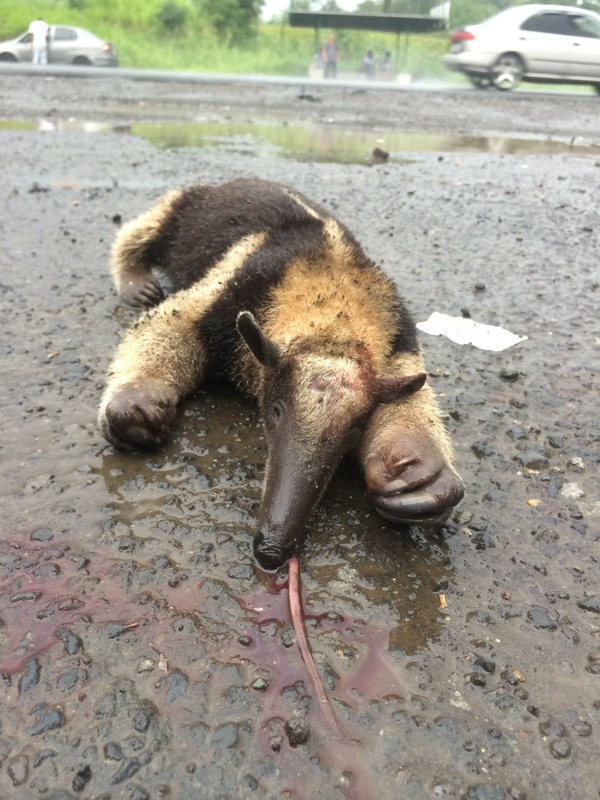 On one of the worst stretches of highway being studied, the road connecting San José to Limón, approximately one animal dies every 2.5 km attempting to get to the other side. “There is a law preventing hunting, so I thought, why isn’t there a law helping animals on the highway?” Arevalo-Huezo said. After seeing the deaths pile up unchecked and the insufficiency of the established government signage, the group began trying to involve the government more in its work. One effort has been a major push for changes to environmental impact study requirements, which currently do not take into account wildlife corridors crossed by roadways or offer solutions to prevent these animal deaths. Another has been to create more effective roadway signs. Established in 2012, the Comisión de Vías y Vida Silvestre, the larger group that Arevalo-Hezo’s subcomittee belongs to, had the primary purpose of acknowledging that there was a problem with animals getting run over. Once enough people had joined, subcommittees were created: an environmental education committee to teach the public about the relevance and specifics of the problem; a law committee to research existing and past laws related to animal crossings; and a science committee consisting of biologists, wildlife managers and professors charged with researching and uncovering previous studies done on animal roadway deaths. What they found was not very reassuring. There are government signs in place warning drivers about animals, but according to Arevalo-Huezo, not only are these signs uncommon, they do an insufficient job in alerting drivers to what’s ahead. Instead of indicating a crossing, these signs are simple and feature only a crude outline of an animal. Some local communities, seeing the growing problem with animals getting run over, have put up their own signs, but because they are not official, the government could take them down at any time. However, the government signage has not been sufficient in stopping animal deaths; last year, the Comité Científico de Vías y Vida Silvestre was called to Ostional when several turtles crossing the road during an arribada were hit and killed. The group reached out early on to Instituto Costarricense de Electricidad, or ICE, Costa Rica’s primary electric company, which had done work related to biological corridors in the past. Because establishing power lines requires forests to be cut in widths of 60 meters, monkeys especially get cut off from their regular habitat and are at a high risk for electrocution. To combat this, ICE began constructing aerial bridges for the monkeys to use to cross the gaps safely, high enough to prevent any animal contact with areas affected by humans. To determine which locations should be a priority, the committee began mapping the protected lands in Costa Rica and comparing them with areas undergoing or designated for road construction. The closer these two areas are, the more dangerous it is for animals, because human activity encroaches on safe territory. The group began to place cameras in these areas of interest to catch animal activity; not only to count animal roadway deaths, but also to calculate which “hotspots” had the most frequent animal crossings. During that research period, Arevalo-Huezo saw certain creatures for the first time – but as roadkill. Since his research of Route 32 began this past March, master’s student Adolfo Artavia has found that 900 animals have been hit and killed in a specific 100-kilometer stretch of the highway. This road to Limón is currently undergoing a major widening project. Artavia began researching in the area for his thesis, but once he heard of the work that the Comité Científico de Vías y Vida Silvestre was doing, especially with regard to studying the effects of road widening, he began sending the group his data along with pictures and other information on the roadkill. Besides finding where the most animal fatalities occur, the group also researched where there were the most successes, and discovered that some animals were using drain pipes to more safely cross roads. On the stretch of the Pan-American Highway from the Costa Rica-Nicaragua border to the town of Liberia, which passes close to two national parks, there are 15 drain pipes, all of which are being used by various species of animals. The committee is looking into the logistics of retrofitting other drain pipes to be more suitable for animal crossings, like the Hacienda Barú Lodge in Dominical has done. The drain pipes are not in use everywhere in Costa Rica, however, so the group wants to use the information they glean from them in other ways. Just as drain pipes are not conveniently located around the country, it would be logistically difficult to build animal-specific crossings on every road. That is where the group’s original research and idea comes in — signs. Where there is a large number of animal deaths, but not at a high enough magnitude to necessitate an underpass or in an area too difficult to build one, signs can serve as a warning to drivers to minimize the deaths. Working with Garnier BBDO, a design company that donated its services, the committee created a sign specifically to convey the message of an animal crossing, not just that of an animal presence. “We were trying to think of a way to communicate to the public that this crossing by the animals has always existed in these places, and we are the ones that have put a highway through their crossing, so the green shows that it was already there,” Arevalo-Huezo said. 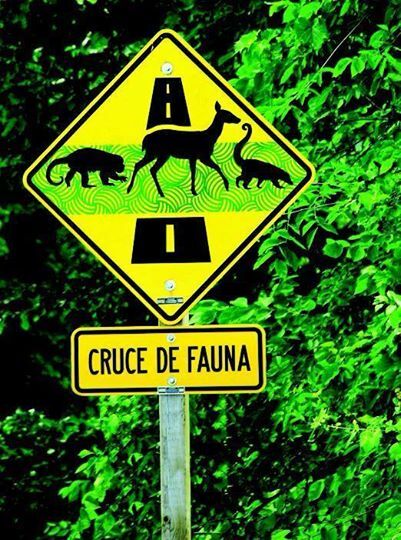 The sign depicts a deer, a monkey and a coati on a bed of green grass, which represents the movement of the animals actually traversing the road. Arevalo-Huezo hopes these signs will better convey to drivers the need to slow down near these biological corridors. With support from the government, six signs were manufactured. 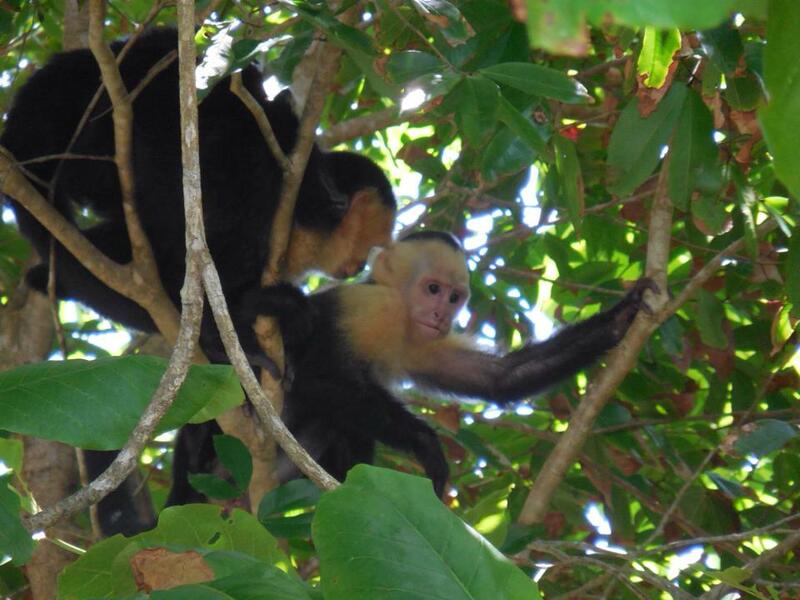 They were unveiled July 30, National Wildlife Day in Costa Rica. The future locations of all of these signs are still not certain, but Arevalo-Huezo said that the committee already knows of a spot in Dominical where a sign needs to go, as well as on the Cerro de La Muerte, the highest part of the Inter-American Highway that runs through Costa Rica, where tapirs have been known to get run over. Artavia also wants drivers to be more aware and recognize the problem that is in front of them. “People aren’t aware of how big of an impact roads have; they don’t visualize the problem, and think there is none,” Artavia said. He suggests that the government add a question or section about preventing roadkill to driver’s license exams. It is not that animals need to cross the road — it is more along the lines that their home and family have been split apart by the road. According to Arevalo-Huezo, some animals need large areas to roam to find food and reproduce. If humans do not take responsibility for the problems they have caused, the species can be seriously damaged; the health of the animals will decrease and the gene pool will diminish, lessening the creatures’ chances for survival if hit with a major disease, Arevalo-Huezo said. The species may even go extinct. To combat this morbid endgame, the group has drafted a 60-page environmental guide to help others conduct construction projects in an environmentally conscious manner. This guide is being reviewed by SINAC and MINAE (Ministry of the Environment) right now, and Arevalo-Huezo hopes it will be made public soon. According to Arevalo-Huezo, government assistance is necessary to achieve results because the committee does not have sufficient funds of its own. And the sooner, the better, she said. Studies have shown that frogs living closer to roads croak at different volumes and speeds than frogs living farther from roads, and so cannot understand each other when mating season rolls around.